Motorola Defy Review - Learn everything you need to know about the Motorola Defy before you buy. -For a middle-of-the-line smartphone, the Motorola Defy is a great phone. 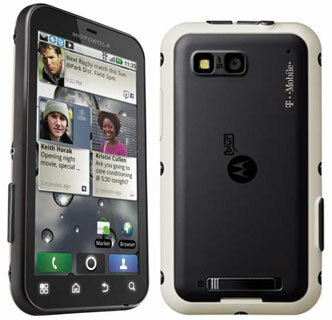 With all of the fragile smartphones on the market right now, Motorola decided to go with something a bit more rugged. Although it doesn’t look rugged when you see it just from the front, you can actually submerge this thing in water and it still works. The major downside of the phone, unfortunately, is the UI. Blur just doesn’t cut it with so many other great UI’s on Android. It also comes with a lot of pre-packaged apps-nice not having to download a lot immediately when you get the phone. Overall, the Defy is a great phone for $100 and will do the minimalist just fine. ­-The aesthetics of the phone are nothing to brag about, simple and sturdy. It really does feel like it would take a drop or two…or twenty in my case. The rubber doors that cover the micro-USB slot and headphone jack are a bit difficult to get open, but you get use to it. The screen resolution is 480 X 854 with a 3.7 inch display. This is standard for even the nicest smartphones, however it is not AMOLED (basically just means they didn’t spend as much money on the screen as others). It still shows great colors and is really good in bright sunlight so nothing to worry about. -The touch sensitivity was good and didn’t record too many missed swipes or touches. Switching from portrait to landscape was a breeze partly because there is no cool transition, but we liked the straightforwardness of this. -If you like having your social networks all in one place this has a good fix for you. The camera does not take great pictures but they aren’t terrible either. It does not have the capability to record in HD either but it still takes video just fine. -The Android operating system gives you the ability to have 7 home screens and use the SWYPE function for texting instead of the regular Android keyboard. -The battery life is rather impressive at 8 hours of talk time and 18 days of standby time. That’s pretty phenomenal compared to many of the upper-end smartphones. -It comes standard with GPS, Bluetooth, and Wi-Fi. The phone also allows you make calls over the Wi-Fi connection which won’t eat up your minutes. However, even if you have the lowest plan, I don’t know to many people that have trouble with going over their minutes anymore. -Just the fact that you can dunk this thing in water and it still works afterward is a pretty awesome additional feature. So, if you find yourself standing by a lot of swimming pools or bodies of water (coupled with the ability to drop your phone quite a bit), this is probably the phone for you. "Thank you for your ongoing generosity and for being a member of The Society. Because of your generous contributions, scientists funded by the American Cancer Society are exploring new areas of cancer research and treatment technologies."